As you can tell from the picture, Essie Mesmerize is most similar to OPI Dating A Royal. 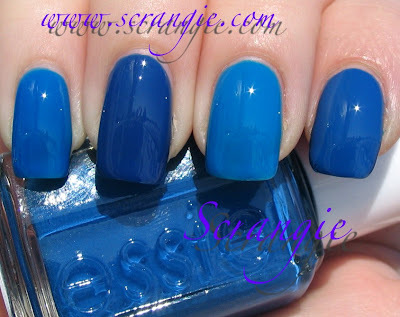 The main differences are that Essie Mesmerize is lighter, a little less vibrant and much more opaque. OPI Dating a Royal needs at least two coats and looks best at three, while Essie Mesmerize is nearly perfect in one coat. Nocti Flying Naked and Misa Pour Me Something Tall And Strong look more similar to Essie Mesmerize in the bottle than they do on the nail. Essie Mesmerize is from the Spring 2009 collection, OPI Dating A Royal was released with the Mod About Brights collection in 2008, and Misa Pour Me Something Tall And Strong came out with the Misa Look On The Bright Side neon collection in 2008. I don't know when the Nocti polish was released, but all of these colors should be readily available and easy to find. I never thought I could like blue nail polish. I love the blues. Thanks for swatching. Still so tempted b/c it's an opaque 1 coater but I have PMSTS. Thanks for posting this! WHY don't I have Dating A Royal yet??!! I need that one sooooo bad! these shades of blue are a total fave. I would definitely grab OPI's Dating a Royal. hhmmnnn.. lovin' the name too.LOL. Scott, embrace the blues. :D They're amazing. Katee, it's fantastic, you need it! J, You're welcome :D I have to admit, Mesmerize is really, really nice. There are never enough blue creams. I love my glitter with a hungering passion, but blue creams are good for the soul...until I corrupt them with a glitter top coat. aaahhh blues. so beautiful n calming :D LOVE! Tarotbydiana, bwahahaha! :D I am the same way! !